I love museums. I especially love clothing and textile exhibits at museums. 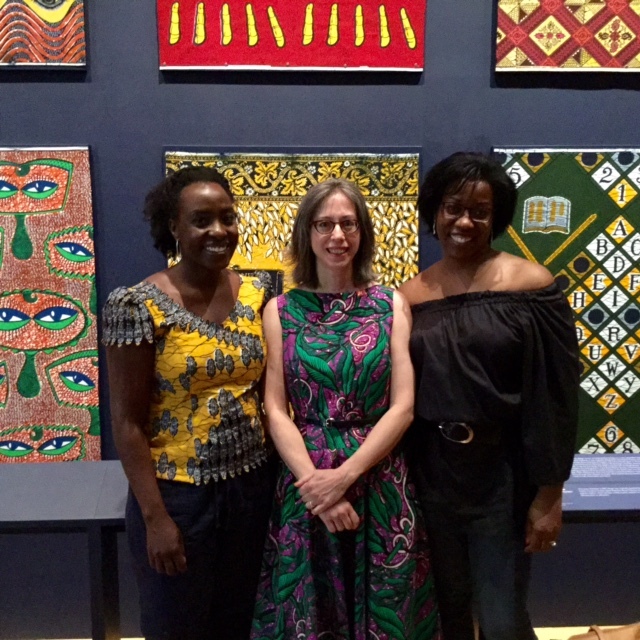 So when Claudine and I started talking about meeting up and she mentioned the exhibit at the Philadelphia Museum of Vlisco textiles I was onboard. The actual exhibit is called, "Creative Africa" and the Vlisco textiles are just one part of the exhibit. See more information about it here. Okay I will admit that I don't know much about Vlisco's textiles, except the fact that there is a lot of interest in them in the sewing internet community. I've seen some of the garments made using African prints but they've primarily been skirts which I've admired and then moved on. I'm now sold on these textiles. When you enter the space, there is an exhibit stand with about two dozen outfits. The outfits are so awe-inspiring and such a creative assault on your senses, that I had to take a breathe before I could step into the space. The walls of the space are lined with different versions of the textiles. It was intriguing to walk around the space and see how many items have been memorialized in the textiles. There were computer screens with videos of the fabric and information on the computer, as well as, each textile was given a plaque which described the how, whats and whys of it. The day was made even more amazing because of the sewists I went with ~ Claudine author of the blog, Rolling in Cloth; Andrea author of the blog, Knit-Knac; and Renee who authors Miss Celies Pants. I love sewing conversations and in this case there was also a lot of talk about knitting machines and the process. Now I can knit - don't like it much but I know how - so the knitting machine convos were really interesting to me. If you're in the area, I would highly recommend that you take an afternoon and head over to Perelman Building of the The Philadelphia Museum and see the exhibit. The exhibit is on view until September 25th! After the exhibit and a leisurely lunch - Claudine and Renee left and Andrea and I headed over to Jomars. I love Jomars and I've shopped there for the last 15-16 years. I went there a lot when my girls were smaller after I was introduced to Jomars by a friend, Julie, when I was a member of an internet sewing group - The Sewing Circle. I've spent hundreds of dollars there and have wonderful memories of road trips with friends to purchase fabric...so Jomars has a soft spot in my heart. Even visiting it during the PR Philly weekend a couple of years ago. However, the Jomars I visited with Andrea Friday was a sad facade of the amazing fabric palace I remember. We did root around on the tables and I found a few pieces but it was a truly disappointing visit. I was determined to purchase some New Look and Simplicity patterns because they are harder for me to acquire. Simplicity patterns were on sale for $1.99 so I bought four including a few "Early Autumn" ones. Though I don't understand how those are out already when Summer arrives on Monday - I'm just sayin'! ...and the reason I had a gift card in the first place is because one of the fabrics I'd purchased online wasn't in stock anymore. Though it was in the Willingboro store - so I got four yards of this amazing linen blend! I had an amazing day, full of fun, good conversation and fabric shopping! It was a good day. Oh My Lord. I have to get to that show. Retail is hard, and some people make it harder by expressing their misery at being in the wrong place at that place (one of my son's managers comes to mind, so does Me at the Wrong Office Job I had for a time). And there are stores I will never walk into again because of it. I'm sure they are trembling. JoAnn's seems to only stock their own fabrics, which tend to have sparkly stuff in them, whether they need it or not. I picked up some patterns and discontinued zippers there today, but I tend not to buy fabric there. That linen though.....is tres belle. But my Vlisco bill weighs heavy on my mind. Those african print garments are so inspiring! I'm really loving ankara print these days. You picked up some really beautiful fabric! Wow! Those garments on exhibit were beautiful! Glad you were able to do some shopping afterwards. I picked up one of the patterns you purchased for $1.99, the peplum top. I lived in the Lehigh Valley, PA from 2000 to 2003 and visited Jomar. I was not thrilled with the store at that time but did find some a linen like fabric at the time which became a jacket. Still have it in my closet and not worn for years. Wow! Those African fabrics are gorgeous. As are the outfits. Thank-you for sharing - armchair traveling of my favourite kind. Those dresses on exhibit remind me of the Gullah art we have here in the low country of South Carolina, especially Jonathan Green's portraits of the Gullah women. Very colorful and vibrant as are the people! Your pictures are inspiring to see the use of these beautiful fabrics. You were right--those African print garments were an amazing assault to the senses. Absolutely beautiful. Glad you had such a delightful weekend. Oh, foo! My trip to NYC isn't long enough to include a side visit to Philly! So THANKS for sharing your visit with us! What breathtaking textiles! Sorry to hear about Jomars. I remember going there with you and Peggy... was it 5 years ago?!?! Yes, I think it was that long ago! But that trip was all about Fabric Mart! *LOL* While you're in NYC you should try to see the Isaac Mizrahi exhibit at the Jewish Museum. It's in town until August 7th. I'm gonna try to get there soon. What a wonderful post. Those African dresses are breathtaking. You are so lucky to have seen them! Thanks patsijean for the extra links - however, I do have the Vlisco link in the post. Can you not see the link? It works for me so I'm just wondering? Thanks! FYI- The link shows up if you pass your cursor over it. But no, it doesn't just show in the text. I have been admiring these African fabrics for so long! They are gorgeous and to see them made up in such contemporary styles is amazing. Love the dress with the chickens! Thanks for the tour, Caroline. I really enjoyed and glad you enjoyed such a good time too. Gee, thanks for adding 1 more fabric type to my growing list of must haves! I have a source for shweshwe (spelling?) but this is so different. Love the colors! What a great tour! I wish I could have joined you ladies! Beautiful fabrics and exquisite clothing! Shopping, lunch and good conversation, what more could you ask for!! The exhibit looks amazing! May have to jump on the Patco and travel across the river to visit this exhibit and do lunch or brunch too! I've never been to Jomar's but a few ladies I know have and it's on my bucket list - heard the lining fabric is a good buy but hit or miss. I did buy some nice Nicole Miller fabric at Joann's but I'm pretty spoiled with NYC garment district fabric and a local shop so I usually just hit Joann's for the pattern sales. Sorry you had such a bad experience. I enjoy reading your blog so much! I'm a curvy sewist from Texas, and will be in Philadelphia next month. Thanks to you, I will enjoy the exhibit at the museum. I was telling my family about it, and called you a friend. Mybfamily laughed, but I really feel such a connection to the talented bloggers I follow. Carolyn, thanks for sharing the images of the museum tour, the designs are so inspiring and the prints are breath taking. also looks like an awesome day with sewing friends!